about the media DVD with interviews on memories of the ‘marts’. 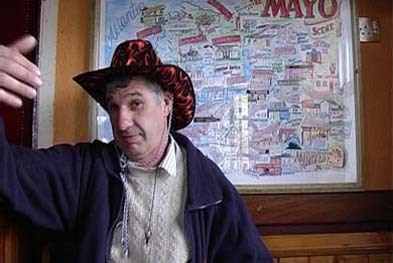 about the project “Penning the Marts” is a site specific video project that Morley proposed to do for the open submission exhibition “Claremorris Open” in 2005. This annual contemporary art exhibition takes place in the rural town of Claremorris in County Mayo, Ireland. 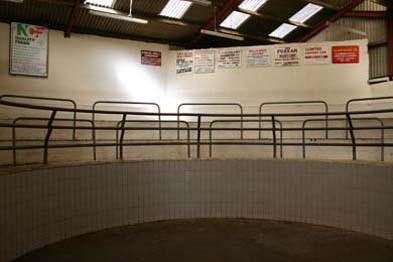 For the video Morley sought contact with people who wanted to share their memories of the ‘marts’, the weekly organised cattle market in Claremorris that closed down in 2003. As a result of the changing agricultural policies, for a lot of farmers it is not feasible anymore to keep cattle. Farmers and inhabitants of Claremorris tell Morley about the social function of the former marts and about the changes in agriculture. The piece was shown simultaneously in the gallery space and in O’Briens Bar, which is the bar where many of the farmers go and where some of the interviews took place. This way of showing had the effect of opening the piece to be more accessible to all aspects of the local audience. Megs Morley (Ireland, 1979) studied sculpture and combined media in Limerick, Ireland. Her work combines elements of performance, video and installation and draws upon the issues raised in the history of film and photography. She has exhibited in various national group shows and often collaborates with Peter Morgan and Tom Flanagan. Morley was awarded two travel and mobility bursaries in 2005 and is currently an assistant administrator of Artspace Studios in Galway and a member of the live art project Enso.